I don’t remember why I never got around to watching the 1998 Les Misérables movie before — I was heavily into the musical at the time it was released (even subscribing to a fan newsletter and running my own fan website), and I was certainly aware of the film. It may have simply been a matter of “it’s not the musical” (or possibly “Éponine isn’t in it”). Whatever the reason, I never got around to watching it until now. On one hand, I wish I had seen it at the time. On the other, I might have been more caught up in “Augh! It’s different!” objections when I was younger. I’m a lot more mellow about adaptation changes these days, except when they completely miss the point. Not that it’s hugely different, but there are some fairly major changes. It’s beautifully shot, some of it on location in Paris. It’s as visually appealing as the Tom Hooper-directed 2012 musical (my review) — more so, when you factor in how gritty the 2012 version gets. (The sewers in this version must have been the cleanest in Europe. The sewers in the Hooper version….let’s jus say they’re a bit more true to the sewers in the book.) I’m not familiar with director Bille August‘s work, but I see that he also directed The House and the Spirits – a movie that I remember thinking (at 18) was a dull waste of a great cast. Fortunately I never got that feeling here, though both are epics dealing with the intersection of family drama and political turmoil. I was pleasantly surprised to see that the music was composed by Basil Poledouris, whose score for Conan the Barbarian is one of my favorites, but this score didn’t make much of an impression. This is another adaptation that focuses heavily on Jean Valjean’s story, to the exclusion of everyone else’s threads, in order to cram at least one complete story into a single movie. (The musical is unusual in that it actually treats the story as an ensemble piece.) It’s not quite as extreme as the Jordan/Perkins version. Sure, it drops the Thénardiers once the action moves to Paris, and the rebellion seems to take about as long as the chase through the sewers. But Fantine and Cosette have more presence, and it does a much better job of setting up the revolutionaries and making it feel like they have their own story that’s intersecting with Valjean’s, even if you don’t see much of it. The acting is much more…human here than in the 1978 version, though it does suffer from not showing you at least a little of Valjean’s backstory at the beginning. I liked the way they tried to expand Fantine’s story, showing a little more of her slow descent into poverty and giving her and Valjean the beginnings of a relationship, cut short by the fact that she’s dying. You can imagine the two of them raising Cosette together in a happier world. I also liked what they did with Cosette, giving her more agency and allowing some of the fire to burn that is tightly controlled by 1832 society in the book, and completely absent from the 1978 version (my review; she and Marius could both be replaced by cardboard cutouts). 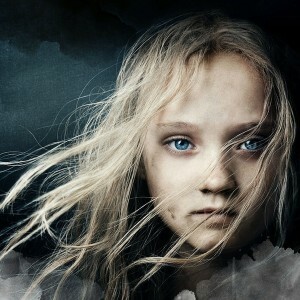 She’s the one who chooses to leave the convent, not Valjean. She demands answers from her father…and gets them. She even convinces him to help Marius during the rebellion. I was impressed that, 16 years ago, they took the bold step of making Enjolras black…until I saw that they’d made him second in command. Way to throw away an opportunity. For the most part, these changes work. But it’s baffling when they make changes that don’t have any clear purpose, except maybe to make them easier for the English-speaking actors to pronounce, like changing names (Fauchelevent becomes Lafitte, and Montreuil-sur-Mer becomes Vigau). And then there’s the fact that Valjean actually tells Cosette the whole truth during the insurrection. That makes the main conflict for the last 100 pages of the book impossible, which is probably why they just stop with Javert’s suicide. My wife and I watched as the credits rolled, and said to each other, “They’re leaving it here?” But the earlier change didn’t leave them anywhere to go, except maybe the wedding. It’s the only way to honestly walk away with anything resembling a happy ending, but it’s also deeply unsatisfying. This entry was posted in Reviews and tagged Adaptation, Movie on September 13, 2014 by Kelson Vibber. 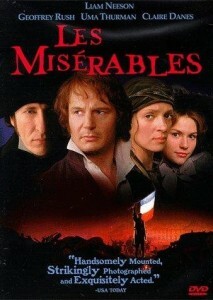 I think I’ve unwittingly started another project: watching the various movie adaptations of Les Misérables. One of the hazards of searching Netflix by title. I watched the 1978 film starring Richard Jordan and Anthony Perkins. It’s extremely focused on the story of Jean Valjean vs. Javert, and while it’s able to add more to that thread, the whole suffers. The Thénardiers are basically gone, you don’t get any sense of what Fantine was like before her fall, and the insurrection and barricade feel like just one more event in passing, not the culmination of a major storyline. And while they didn’t technically change the ending, they stopped early enough to make it happy. Jordan is a good Valjean during the first half of the movie, but is somehow diminished in presence after the final time-skip to 1832. I can’t quite put my finger on why. Perkins is an imposing Javert, and as in the book he tends toward insufferability and even cruelty when he’s sure of himself. The confrontation at Fantine’s deathbed is a particularly frustrating scene to watch, and yet it’s exactly what happens in the book. He’s also completely obsessed, to the point that he requests a transfer specifically to follow Valjean to Paris, and contests another transfer that puts him off the trail. Ian Holm shows a lot of promise as Thénardier, but sadly only appears in one scene. I’d really hoped to see the shrewd, dangerous Thénardier of the novel. The film opens with Jean Valjean’s theft of the bread, and spends some 20 minutes or so following him through his prison sentence and various escape attempts, showing his descent from a fundamentally decent man to a savage animal. He really is “a dangerous man” by the time he gets out. Strangely, Valjean is never released on parole in this version. Instead, he escapes by falling into the river (as he does during his second stint in prison). Some of the characters glossed over in the musical get a little more attention here: Bishop Myriel’s wit has a chance to shine. Mme. Magloire actually has lines. Even Sister Simplice, the ageless woman who never speaks a word that isn’t true, appears. But the whole Thénardier family is gone, including Éponine. Even the ABC students are little more than background characters. Every once in a while someone speaks a line of philosophy, and the phrasing sounded familiar every time. This would have been just two years after the Norman Denny translation that I just finished reading. I wonder if that’s the one they were working from. Fauchelevent’s interview with the Mother Superior at the convent — a rare bit of humor. How and why Valjean and Cosette left the convent. The chase through the streets of Paris was done much better here than in the 2012 movie, though they decided to set it during the day. Things start really diverging after the jump to 1832. All the time they put into Valjean’s prison sentence has a cost, and that’s cutting the rest of the story down to the bone…and then amputating. The ABC students never really get any focus. They’re giving speeches in the park when Cosette and Marius start making goo-goo eyes at each other, and then a few scenes later they’re fighting at the barricade, with no build-up. As near as I can tell, the fighting is continuous (with one odd break, which I’ll get to later). And while I say “students,” I could swear Enjolras is 40. Marius, on the other hand, looks like he’s desperately trying to look older by growing a beard. The movie takes the same love-at-first-sight shortcut that the musical does, but without the songs, and without enough screen time dedicated to the blossoming romance, it’s not convincing. Marius’ grandfather actually has something to do in this version, though why they put him in a gigantic country palace instead of a well-to-do Parisian house, I couldn’t tell you. He’s rich, but he’s not that rich. Back to the barricade: Gavroche dies just returning from his errand. If they were going to include him at all, you’d think they’d feature his signature moment. Then Valjean shows up, and the army stops shooting because “he’s a loyalist” while he picks up Gavroche’s body and carries it over to the barricade. Then they start up again. He’s got some serious Plot Armor. It feels like they were going down a list of bullet points from a plot outline, crossing off what wouldn’t fit, and just making sure the others appeared on screen without really connecting them. 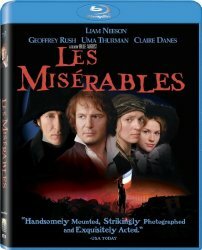 I found out afterward that the DVD is actually cut down from the original version, and the additional 30 minutes include the scene in which Valjean is buried alive. I would have loved to see that. I also wonder if the full version paid more attention to the rebels and barricade. One thing that bothered me was Javert declaring when he confronts Valjean in the sewers that “there is no God, only the law.” That’s not how he thinks at all. He believes in order, and the order of society includes the church, but since he believes the law is infallible, he just assumes God agrees with the law and doesn’t really give it much thought. What ends up breaking his mind is that the levels of “right” above him have come into conflict. Giving him this line not only alters his character, it casts the entire story as a struggle between a good Christian and an evil atheist, instead of the struggle between two men who are both trying to be good, one helping people at the expense of the social order, the other preserving the social order at the expense of people. 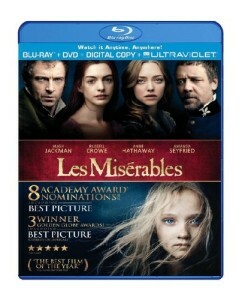 The ending works well enough if you don’t know that the original story runs all the way to Valjean’s death. 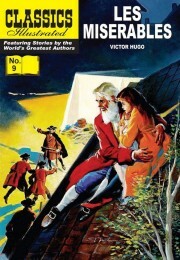 It’s at least a matter of just stopping early rather than altering events to make them turn out happy (Valjean is too melancholy for that to have rung true), and it’s still a bittersweet ending, but it doesn’t quite fit. It could be worse, though — the 1998 movie cuts out even earlier, and I once saw a version of The Glass Menagerie that had a happy ending. 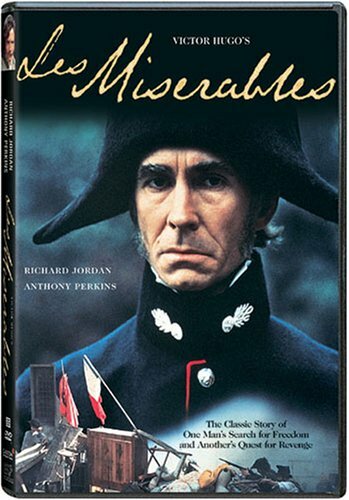 If you’re in it for the Valjean/Javert story, this is a great version to watch, especially the first half, before it settles into bullet-point storytelling. If you like the other characters more, you won’t find a lot here. This entry was posted in Reviews and tagged Adaptation, Movie on February 9, 2014 by Kelson Vibber. 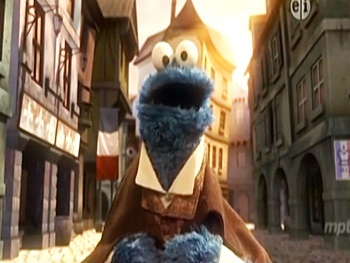 Yesterday the Les Misérables Broadway page on Facebook linked to a YouTube video of “Les Mousserables,” a Sesame Street sketch in which Cookie Monster, as Jean Bonbon, must learn to recognize other people’s feelings and share his cookies. It was…okay I suppose. It had its moments (like “One Day S’more”), and it was fun to see them take on the movie’s visuals (Snuffleupagus as the Elephant of the Bastille, for instance). Maybe my expectations were too high, or I was in the wrong mood for it. I’ve seen a number of “Elmo the Musical” bits that were quite entertaining, and I loved the “Finishing the Splat” sketch with Oscar the Grouch. Yes, I have a toddler in the house, in case you’re wondering. YouTube recommended “Les Miseranimals,” which has long been one of my favorites. It’s the sketch that got me to look at Animaniacs at an age when I was old enough not to be interested in afternoon cartoons (with the exception of Batman: The Animated Series), and it was quickly clear that even if the show was aimed at younger viewers, there was plenty of fun for a teenager to enjoy as well. So we all watched a grainy copy on the tablet even though the crisp DVD was sitting on a shelf across the room. It still holds up, though some of the songs work better than others. I’m not sure how I never noticed before that M. Tristesse (the restaurant owner) is basically one of John Cleese’s French caricatures from Monty Python. I also found it sad that Rita’s song “There is a Flat in Gay Paree” is no longer shorter than “Castle on a Cloud” in the current version of the show. From there YouTube recommended a clip from Forbidden Broadway‘s take on the show, which turned out to be someone’s recording from the audience in some production. That sort of thing bugs me, but I watched the whole thing, having discovered a few months ago that my aging audio cassette is no longer playable (and not having gotten around to replacing it). This was hit and miss, partly because a lot of the parody depends on the show being new at the time. I suppose technically I watched four parodies, because even though we were ready to stop after 30-40 minutes of tiny videos parodying the same show, there was a link to a three-minute clip called “On My Phone.” It’s apparently from a more recent Forbidden Broadway show, and it’s brilliant. This entry was posted in Reviews and tagged Adaptation, Animaniacs, Cookie Monster, Forbidden Broadway, Les Miseranimals, Les Mousserables, Musical, Parody, Sesame Street, Stage on November 16, 2013 by Kelson Vibber.